2019 will be a year of change for STAX Racing. As announced in late 2018, we are one of the teams to enter the newly created Superleague Lights Series, now the second-tier championship at GPVWC. This means longer races where strategy matters more compared to last year’s sprint races in Formula Challenge. Additionally, we now have to look into doing our own Research & Development to upgrade the car and allocate our engines for the whole season. Not only will we start in a new racing series, we also have a completely new driver lineup with Johan Lindberg (#36) and Matthew Marquard (#37) joining the team. Both are fast and experienced simracers and know each other well since they were teammates racing for YTF1 in the past. Additionally, we are pleased to welcome Tariq Gamil to the team as our official test and reserve driver. With the jump up from Formula Challenge, we also looked for more personnel outside the racetrack. Petros Christoforou has agreed to join STAX Racing and will help us with Race Reports and as a Race Engineer. He conducted the interview you can read below. The first outing of the new lineup will be the Pre-season test next Wednesday, February 13 2019, at the Autodromo Hermanos Rodriguez. 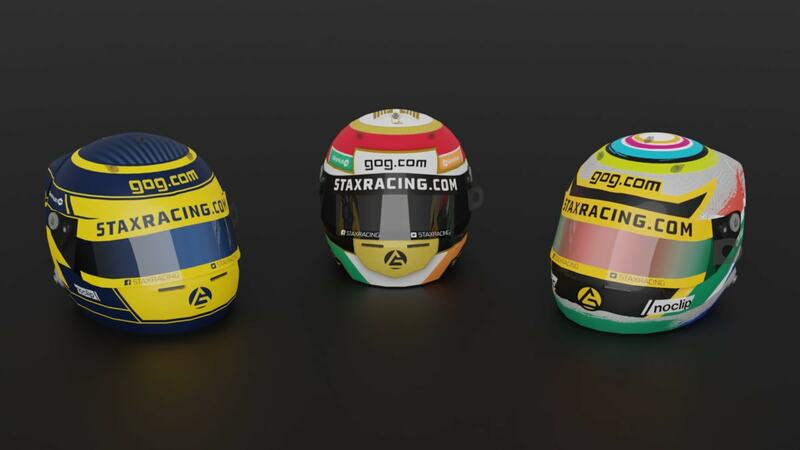 However, the drivers won’t be using their newly designed helmets pictured above. Instead, they will use their old designs one last time as it’ll fit the retro livery of the car. Johan, how happy are you to be joining STAX? I was very happy that Christian asked me to join STAX Racing. I think the team will be a good place for me to develop as a driver in the new Superleague Lights Series. The new race format and car development is a new and exciting challenge for me. My targets for the season are to build on last years’ performance in Supercup and try to regularly finish in the Top 10. What are your thoughts on working with Matthew once more? I’m really happy to be teaming up again with Matthew. We had a great collaboration in YTF1. Hopefully we can spur each other to even higher performances this time. Matthew, welcome to STAX Racing. How pleased are you to be here? I am really happy to be driving for STAX Racing. Not only are they competitive regardless of the series they run, they’ve always seemed to be really passionate about simracing. That’s what you need to get the best out of this. What are your thoughts on the season ahead? Where do you expect to be? I expect to score solid points at every round this season. We’d like to be as close to the front of the field as possible, but as long as that scoreboard keeps ticking over, I think STAX Racing will end up in a very good position. What’s it like to be working with Johan again? It must give you confidence going forward? Of course it’s great to have a teammate that you have experience with. We roughly know each other’s pace, and what to expect on track. Johan is a clean and smart driver, and I think we’ll have a good season together. Welcome to the team Tariq. What made you pick STAX Racing? I joined STAX Racing as I was interested in moving from GT racing back to single seaters. I feel this is a great opportunity to work with a team that was down to earth yet had the competitive desire to achieve and ease my transition into rFactor 2, coming from a background in Assetto Corsa. Hopefully, my general experience and knowledge will serve me well and we do well this season. What are your ambitions for the season? The ambition is always to win and I will try my best to help my teammates with car setup, car development and strategy to help them get as high up as possible. Realistically, considering my inexperience with some physics elements within rFactor 2, I may not be able to contribute a lot initially but I like to think I’m a quick learner and will figure out optimal settings and help the team succeed. I can’t speak for my teammates as the team is new to me, but the team has been very involved and helpful and I look forward to working with Johan and Matthew. One thing is for certain, everyone at STAX Racing has shown dedication and drive to succeed and hopefully, with that, we can get some good results.